[%image reference-image float=left width=150] The Maine Sea Salt Company evaporates seawater in solar greenhouses. 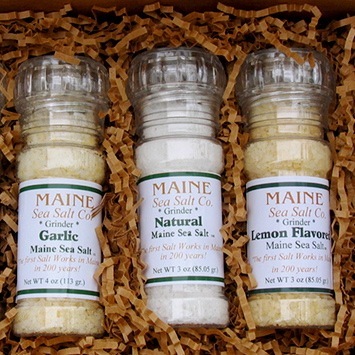 The all-natural results are then packaged in pure and flavored (garlic, lemon, etc.) versions. [%image lobster float=left width=150] The state that sports a lobster on its license plate must have plenty of the crustaceans clacking around. The family-run Atwood Lobster Company fishes the coastal waters of Maine and ships both live and frozen lobster as well as crab. Stonewall Kitchen’s baking mixes and preserves are sold nationwide, but at the online store of this York-based specialty foods purveyor, you can look through their entire collection of baking mixes, jams, and sauces. block(clear green). Have a favorite regional specialty from Maine? Share it in the comments section below.